The Philippine Health Insurance Corporation or PhilHealth is a government owned and controlled corporation that deals with health care financing for Filipinos. PhilHealth helps members and the qualified beneficiaries and dependants in medical and hospitalization expenses. If you want to take advantage of the benefits given by PhilHealth to their members, you can apply or register online, you don’t need to appear physically in the PhilHealth office to file an application. When you qualify for PhilHealth Online registration, proceed by following the instruction below. Please note that the steps given are only the Phase 1 of the registration, Phase 2 instructions will be sent to your email after you complete the steps below. 1. 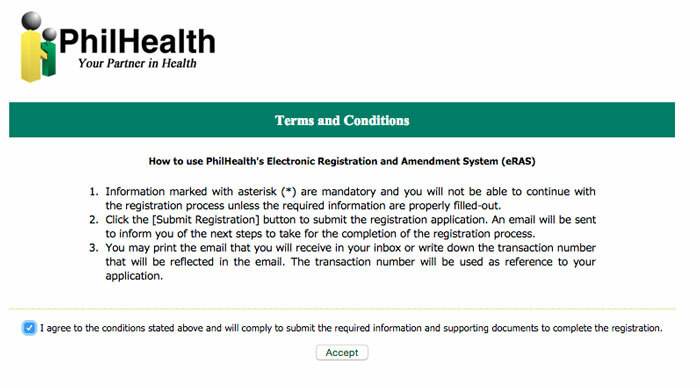 Go to PhilHealth e-register website at https://eregister.philhealth.gov.ph/ then click “proceed”. 2. Read the Term and Conditions carefully, then tick the checkbox to agree and click the “Accept” button. 3. You will arrive in the registration form, fill out completely and make sure it is consistent with your other credentials to avoid problems in the future. Don’t leave the field blank specially the one with red (*) asterisk. You cannot submit the form if it is incomplete. Attached scan copy of your valid ID, select which type of ID you want to attach in the Upload Documents section, then find the file that you want to attach. If everything were all set, enter the Capcha, then confirm all the information that you entered are correct by ticking the checkbox and then click “Submit Registration” button. Check the email address that you provide in the contact details for further instructions on your online application. As I mention before the steps above is only the phase one of the registration online. After receiving the confirmation message from PhilHealth that your application was successfully approved, you can start paying your premiums to become active and eligible for the benefits of PhilHealth.